What does your sunscreen's SPF 30 tell you? Essentially it represents a sunscreen’s measurement of protection in time, provided against the sun's shorter wavelength ultraviolet B (UVB) rays. These UVB rays are known to be the cause of sunburn and can lead to skin cancers. This Sun Protection Factor (SPF) number is determined through laboratory tests performed by certified organizations around the globe. The tests involve human volunteers who are subjected to a UVB spectrum meant to mimic the UVB rays produced by a noon-day sun. 30 will be the result obtained from this test. The SPF measures a length of time rather than an amount of sun protection. It gauges how long the sun would take to redden your skin when using a particular sunscreen compared with the amount of time without any sunscreen. Technically, it measures the amount of light that induces redness in sunscreen-protected skin, and divides it by the amount of light that induces redness in unprotected skin. If the result is 30, it means the sunscreen will provide 30 times more protection than if the individual had worn no sunscreen. Eg if you take 10 minutes to turn red, wearing a sunscreen classified SPF 30, you will take 300 minutes before you burn. This depends on the application of the sunscreen being sufficient, and being reapplied after sweating or swimming, or toweling it off in any way. SPF 30 - How exactly is it tested? 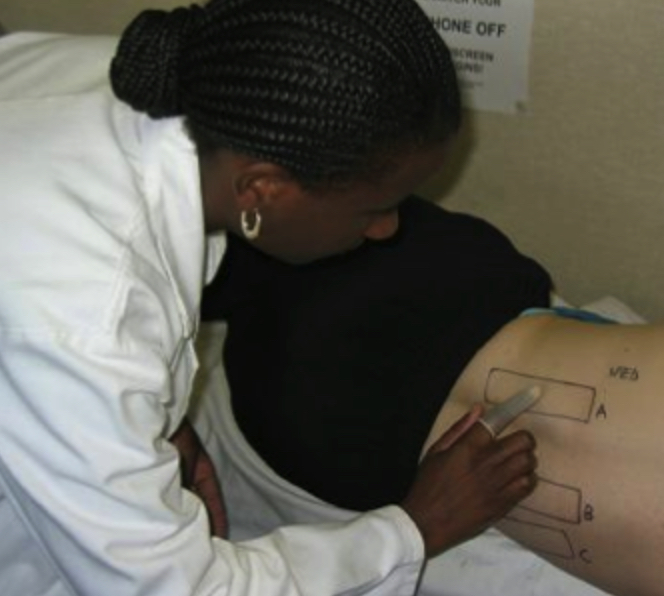 Analyze volunteers’ tendency to burn by shining a UV lamp that simulates solar rays, onto the skin of their backs. This determines the amount of time in the sun that it takes to make their unprotected skin red. Then a laboratory technician will carefully apply a specific amount of the sunscreen to measured-out squares on the volunteers’ backs, rubs it in, waits 15 minutes for the sunscreen to absorb and then directs the solar simulator on the skin again. If, say, an SPF 30 sunscreen is being tested, and the patch of protected skin goes 30 times longer than the unprotected skin before reddening, it proves that the product is at least an SPF 30. This test is done on at least 10 paid volunteers, with the average of the results confirming the SPF rating. 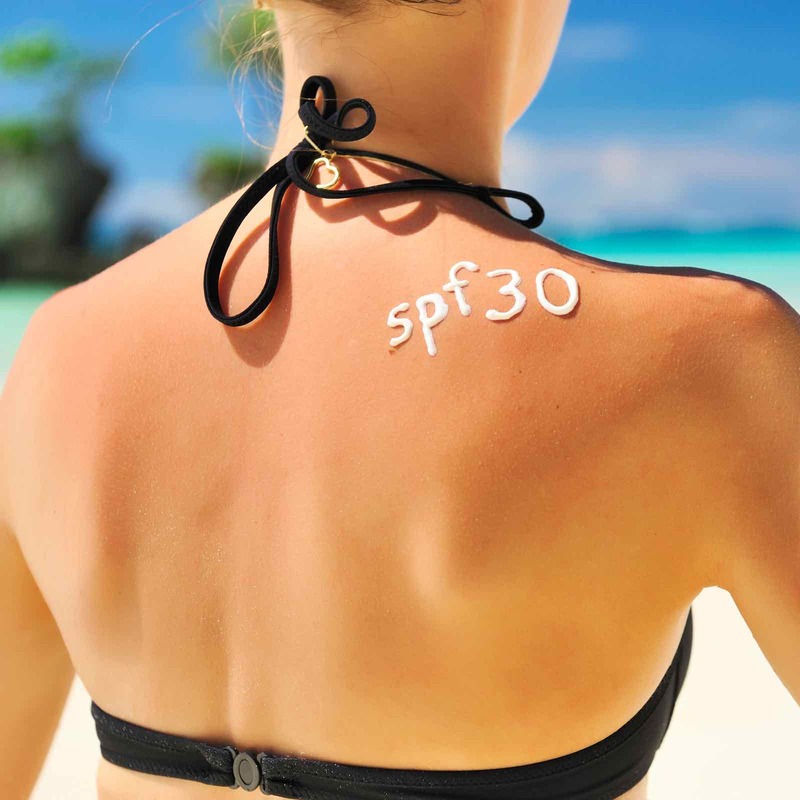 A common question asked is whether or not SPF 30 has twice as much sun protection as SPF 15. 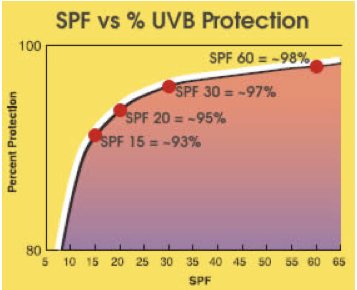 UVB protection does not actually increase proportionately with a designated SPF number. For example, an SPF of 30 screens 97 percent of UVB rays, whereas an SPF of 15 screens 93 percent of UVB rays, and an SPF of 8 screens 50 percent of UVB rays. SPF 30 - how to choose which SPF? Most people feel safer using an SPF 30 rather than an SPF 15 because of the extra protection but it's up to you to decide which SPF rating will suit your skin's needs in your specific circumstances. If you know that your skin burns easily or that it doesn't take very long for it to get sunburned, a higher SPF is definitely recommended. It helps to know your skin type in this respect. See this World Health Organization page which encourages the public to use their guide on UV levels and their intensities, through use of UV indexes. You can find daily reports of UV light levels, which can also help you determine how much protection you should opt for. Another recommendation is to make sure you choose a product that is labeled as a broad spectrum sunscreen that will effectively fight against both UVA and UVB rays. There is currently no uniform measure of UVA absorption, although there are a few options available and you are recommended to look for a sunscreen specifying very good or excellent UVA protection. When specifically developed and manufactured sun-protective UPF clothing will usually equate to an SPF 45 or 50. Whichever SPF you choose, wearing sunscreen should not provide a false sense of security about protection from UVB exposure. No sunscreen can provide 100 percent UVB protection. Using a higher SPF provides greater UVB protection than a lower SPF, but it does not mean that you should stay out in the sun longer than necessary and always diligently reapply. The bottom line is to avoid any sunburn as that is what causes skin damage and potentially skin cancer.